This example demonstrates the use of C# delegates to solve a task in which the characteristics of geometric shapes are calculated. the method returns a double value, which is the result of the calculation. 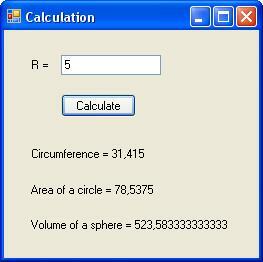 volume of a sphere. Formula: V = 4/3 · π · R3. Methods must be declared as static (with the keyword static). 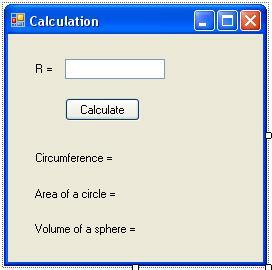 the name of the method that computes the volume of a sphere is Get_Volume(). The delegate type and method type declaration is implemented in the Form1 class of the main application form. 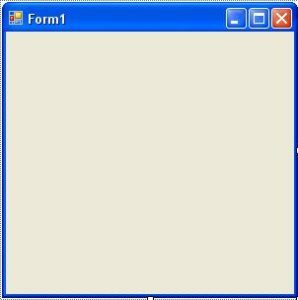 Create a project using the Windows Forms Application template. The name of the module of the main form “Form1.cs”. You can specify the project name, for example, “Delegates01”. The instance name of the Form1 application object. The window for the newly created application form is shown in Figure 1.
a control of Button type with the name button1. in the control button1 property Text = “Calculate”. After the performed actions, the form of the application will have the view as shown in Figure 2. The delegate type is named CalcFigure and declared in the Form1 class (the file “Form1.cs”) before the constructor of Form1() form. When you declare a delegate type, the ‘delegate’ keyword is used. Methods are declared in the form class after the Form1() constructor is implemented. Методы объявляются в классе формы после реализации конструктора формы Form1().In accordance with the condition of the task, the methods in the class are declared as static with the static keyword. The next step is programming the click event on the “Calculate” button (button1 control). The radius of the circle is read into the internal variable radius. Conversion from a string to text is done using the Convert class (the ToDouble() method). The next step is to build a delegate named CF. This delegate is initialized with the value Get_Length. This means that the delegate refers to the Get_Length() method. In the next steps, the CF delegate is redefined according to the methods Get_Area() and Get_Volume(). The next item displays a different implementation of the event handler. The click event handler on the button1 button can have another implementation, which is more obvious and simplified. In this case, the so-called group transformation of delegated methods occurs. With this transformation, the keyword new is omitted. The program code is simplified. The program window after running is shown in Figure 3.